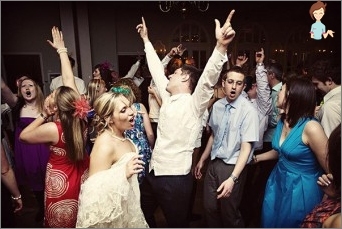 Dancing at the wedding: how to choose a music program? Dancing at the wedding takes up a significant part of the festive program. Of great importance is the first dance of the young, as a symbol of born love. What should be the wedding dance? Today, dances at the wedding are her unchanged,As well as the main attribute. Just a few years ago the newlyweds went to the center of the hall and performed their first dance as a husband and wife. Today, the bride and groom strive to surprise all those present and show something new that will be remembered for a long time. Often, parents of future spouses and other guests are involved in this process. In the preparation for marriage mattersall. There are no trifles here, which means that a slow dance for a wedding should also be carefully thought out and rehearsed. But first of all you need to pick up music to it. What it will be - only for the young. Classics are slow, slow compositions,Under which it is so easy to spin in the rhythm of a waltz. There are plenty of options to choose from here - the waltz of Tchaikovsky, Strauss, Chopin and other classics seems to have been created for two lovers. Not less popular are the modernMelodies. Young often choose the musical accompaniment, which means a lot in their life, for example, a song, under which they met, first confessed to each other in love, etc. Suitable compositions can be found inRepertoire of such performers as Bryan Adams, Celine Dion, Mariah Carey, Sting, etc. Creativity of these singers is known to everyone and many of their hits evoke pleasant associations associated with the first feeling of affection and love. 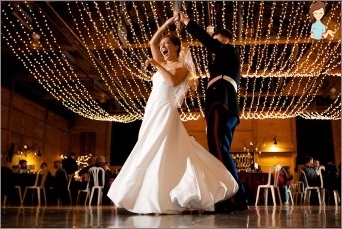 If you want to produce at your own weddingA sensation and make the guests remember this day for a long time, it is preferable to entrust the setting of the dance for the wedding to a professional choreographer. He will teach you how to move properly and flexibly and will make your joint dance shake everyone to the core. He can put a number that wouldAllowed to fully reveal the meaning and content of music for young people's dance at the wedding. If you do not want to go the beaten path and want to be the first in everything, try putting the number under some Russian folk song or tango, why not ?! You can impress the guests with an incendiary cancan, andYou can make them laugh heartily, danced to a cheerful and comic composition. In any case, no one limits you, because it's your day and decide how it will be, only you. Remember that it will not happen again and you will not have a chance to beat everything. However, choosing music for the first jointDance, you need to consider the attire of the bride. And if the groom's clothes can not become a hindrance to any movement, then the bride's dress may well be an obstacle to the active pas. Therefore, several rehearsals are recommendedHold in the bridal shoes, and if the bride does not want to show the dress to the groom before the celebration, then she should wear at least a skirt with hoops, if the style of the dresses implies this, and see how she can move in it. Do not write off the corset and dresses, it just fetters the movement and can cause your squeeziness and slowness. How to arrange a dance for young people at their wedding? An unusual and memorable wedding dance makes and entourage. Slow sensual composition will attract attention if you move in time with the music with the lights off and lighted candles. You can place them on the floor in the shape of a heart andDance inside this symbol of love. Will enhance the impression of the holiday and something incredibly joyous confetti. Though for a moment, soap bubbles will return to childhood, as if to say to all those gathered that it is still only beginning. You can arrange a mini fireworks display. Picking up music for dancing at the wedding, it is necessary to take into account the age of the guests. The older generation should be able to show themselves to the usual Soviet melodies, for example, hits the 80's. If it is planned to hold a youth wedding, thenMost of the musical compositions can be clubbing. In general, on this occasion, a whole mix of songs of a different genre and direction is selected. DJ will already be guided by the audience and include those songs for incendiary dances at the wedding, which are expected at that moment. The tone of the party can be set by young people at the firstDance, involving in this process all the guests and helping them to relax and forget about shyness. The main thing is that everyone should have fun and good, and no one was bored sitting in the little corner. Merry Christmas and a long family life!